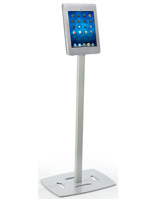 Does your business or school need commercial iPad enclosures ? 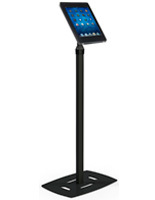 It's no surprise if it's true, as most organizations like to protect their accessories. 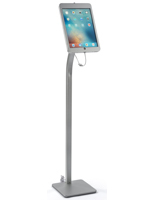 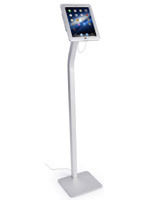 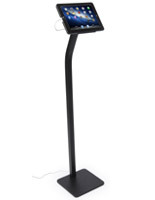 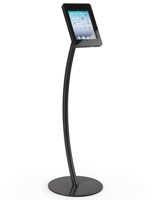 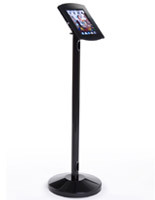 iPad enclosures that are secure stands or mounts for Apple® devices give customers, guests or students the ability to access the devices without device owners having to worry about theft or damage. 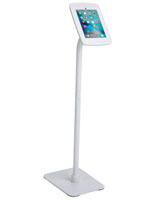 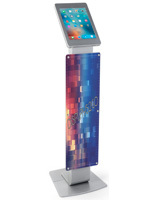 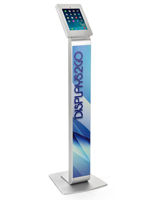 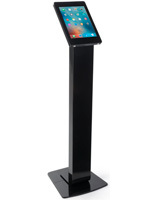 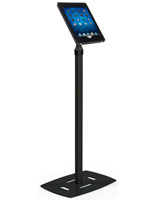 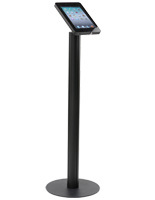 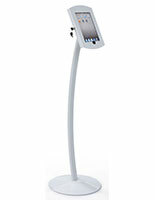 Many kiosks not only include locking casements for a tablet, but also have stands that can be securely mounted in place. Valuable advertising or learning tools, iPad enclosures that lock are constructed to withstand heavy use or high traffic. 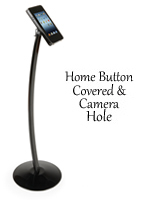 Locking accessories are also available as options on many holders. 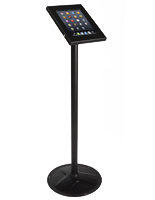 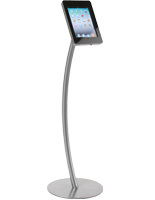 These iPad enclosures, such as those with optional locks, can offer more flexibility of use than stationary mounts. An Apple® or other tablet is a not-insignificant investment for most businesses. 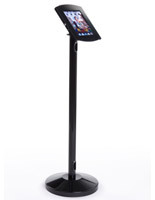 IPad enclosures with a designed-in lock are cost-effective loss prevention options for commercial or institutional users, and even for individuals for home or business use. 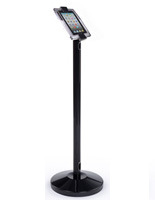 Locking stands come in all manner of styles, shapes, and finishes to match any business or organization's decorating scheme. 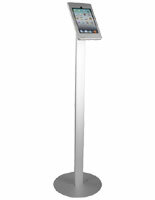 Common colors used for finishes include black, white, and silver, which coordinate well with any environment. 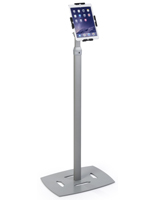 For added strength and durability many models are constructed of either steel or heavy-duty plastic to withstand heavy use and high traffic. 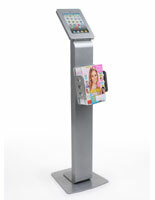 What kind of security mechanisms are available for stands and kiosks? 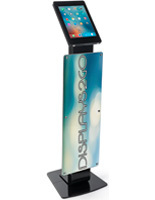 Case Lock - This style envelops the entire tablet in a locking case, leaving only the screen (and ports) accessible. 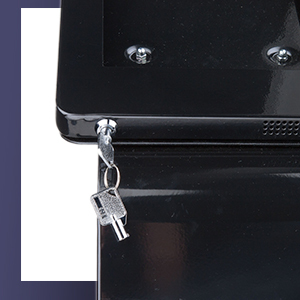 Many enclosures will also remove access to the "home" key in order to prevent unauthorized usage. 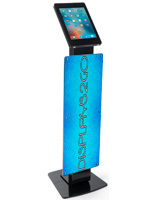 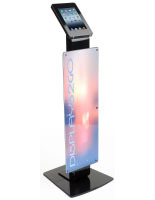 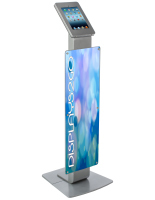 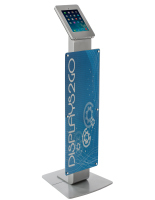 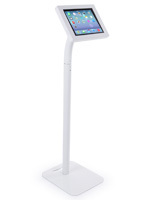 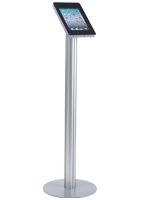 These kiosks are particularly useful in retail environments where the devices may be used for demonstration purposes or to provide users with specific information (like directories or menus). 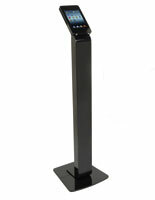 Clamp Lock - These are particularly useful accessories where full screen access is needed. These enclosures clamp around the mounting brackets to secure the device into the holders. 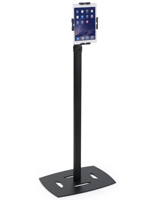 This type of lock is a great choice for classrooms (or even dorm rooms for personal use by students) or retail demonstration stands. 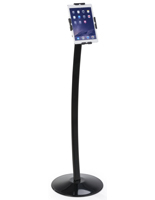 Cable Lock - A cable lock may be (literally) the most flexible locking solution available. 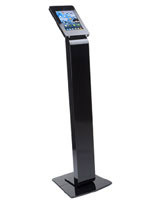 Steel cables are coated with rubber to protect devices from being scratched when in use. 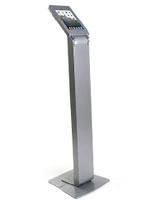 Kensington locks are very popular, and many if not most handheld computers come with a designed in "K-slot" to accommodate their use. 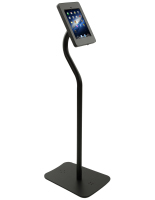 The cable has a lock at one end and a loop at the other, which is used to encircle a fixed object that serves as the mount's anchor when it's attached to the device. 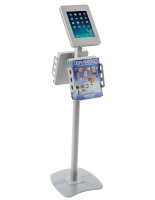 Base Lock - In addition to enclosures that secure a tablet in place, many stands are also capable of being securely fixed in their location. Mounts can use security screws or other permanent attachment methods. 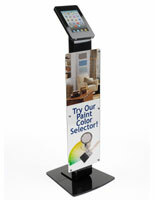 Drill-mount holders will usually come with pre-drilled holes for ease of installation. Apple® tablets have gained in popularity for commercial use. 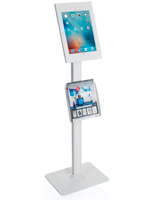 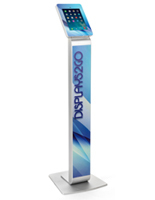 Businesses use these versatile devices for a number of different purposes: to display information, as demonstration stations, as study or learning aids, to project advertising or other messaging, and much more. 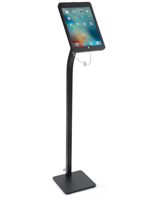 As commercial and organizational use grows, it is important to be able to protect the devices from theft, damage, tampering, or even unauthorized access. 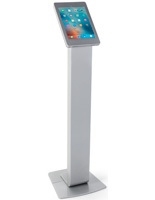 Stands and kiosks that have designed-in or optional locking mechanisms are a smart way to keep devices safe while in use.